For Christmas my wonderful wife bought me a Wacom Tablet - she let me pick out the one I wanted. I've been looking at them for years but they were too expensive and so never got one. I had hoped to be able to get a larger one but when Amazon offered the Refurbished MTE-450 at $40 just before Christmas, and the reviews were so encouraging, it seemed like the size might not be that important. In fact, one reviewer on Amazon stressed the fact the size of the tablet wasn't as important as the quality of the tablet, because the you don't generally make long sweeping movements and the tablet scales to match your screen size. While I haven't used the tablet very much yet, I am finding that review to be true. I have used the (less than) 4X5 tablet with a 22" widescreen monitor and not felt the least bit inhibited by the small tablet. The greatest difficulty I have experienced so far is trying to get the software to completely recognize the pen sensitivity. All of the software will recognize the pen but it is difficult to get the pen sensitivity settings working. I am using the pen tablet with three programs - trying to figure out which one I like best between Paint Shop Pro 8, Corel Photo-Paint 12 (CorelDRAW Graphics Suite 12) and GIMP 2. Suprisingly, the oldest program, Paint Shop Pro 8 was the easiest to calibrate for pen pressure variance. GIMP is the newest and so far I can't get it to recognize the tablet. Even the solutions on the two discussion pages that describe this problem, didn't solve it. I am not impressed with the GIMP help files, even though I suspect that GIMP is good software - especially since it is free! I am surprised that GIMP seems so graphics tablet unfriendly when it is being presented as a graphics program more than photo manipulation program. [See update below.] And I would guess that the open source geeks who are developing it are probably using it with pen tablets rather than mice. I suppose they are my own geek deficiencies that have kept me from uncovering GIMP's full potential. So, for now I am getting the best results with Corel Photo-Paint 12, once I finally figured out how to adjust the very obscure pen variance settings. The auto-detect feature was not very helpful. And, I am considering buying Corel Painter X, which simulates a paint mixing palette and has rave reviews. So, why all the obsolet e software? Who can afford the new software? - Not me! I had wanted to upload a charcoal drawing that I spent a couple of hours drawing on Corel Photo-Paint 12 but the default save settings mysteriously changed to one pixel per square inch and my drawing turned into a crossword puzzle when I saved it. So, that was unpleasant. 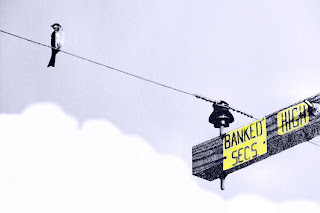 I used the Wacom tablet to render a quick color version of the "Bird on a Wire" to see if I had successfully repaired the save settings, which I've included above. The original print is presented in the post below. 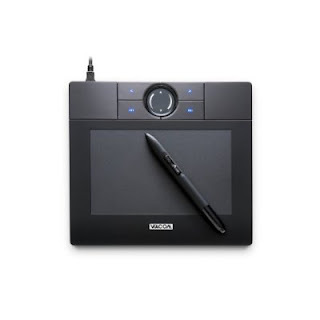 The bottom line is: the Wacom tablet is great - unbeatable at $40 (refurbished was just like new), but the tablet is only as good as the ability of the software to enable you to draw and paint as you intend to. So far, I have spent much more time calibrating than actually drawing - but that is a necessary learning curve. However, it does give me an increased appreciation for my fountain pens! UPDATE: [01-12-09] After using GIMP2 with my notebook, I tried using it with the Wacom tablet on my PC and discovered that it recognized the Wacom tablet by name and model and eve has a dockable menu which gives you a visual indicator of the settings you are currently using with the pen. The remarkable thing is that it continuously updates the menu as you change colors, brush styles, or even when you turn the pen upside down to use the eraser. So, of the three programs mentioned in this review, GIMP is clearly the best, with the exception of the help files. However, it is fairly intuitive. I'll write more on GIMP and the tablet set up later in a separate post.